Within the last four months, most households in my local community have migrated from conventional broadband services (delivering download speeds of between 0.5 and 4 Mbps) to fibre broadband. While feedback about fibre broadband has generally been very positive, I've been really surprised by the number of people reporting problems after migration, including measured speeds that are erratic and/or much lower than expected. On further investigation, I have found that the vast majority of problems have been due to WiFi set-up issues. Therefore, I am devoting this blog post to the subject of WiFi optimisation. WiFi optimisation is essential to ensure that you actually get the full speeds that your broadband connection is capable of delivering, and is particularly important for fibre broadband users. Over the last few years, the use of WiFi has become widespread. All types of devices, including smart TVs, set-top boxes, mobile phones, DVD players, PCs, notebooks and tablets are coming equipped with WiFi connectivity. ISPs are generally issuing new fibre broadband customers with a new WiFi router when they migrate from conventional broadband services. The latest WiFi routers offer dual-band operation (2.4 GHz and 5 GHz) and the latest 802.11ac WiFi standard. Router manufacturers claim impressive performance and range - with speeds of over 1 Gbps! However, the reality of WiFi for many broadband users is not quite as impressive. The reality is that WiFi puts an extra element in the 'chain' between your Internet connection and your devices, sending signals through the airwaves using frequencies that are shared by other WiFi users in the vicinity. limited range. Due to the low transmit powers used with WiFi, range is generally very limited. Speeds and performance drop dramatically with distance, particularly if signals have to pass through walls and floors. Despite the impressive performance numbers typically emblazoned on WiFi router packaging, actual throughput speeds can be significantly lower than the actual speeds of a fibre broadband connection. Bear in mind that, prior to getting a fibre broadband connection, WiFi performance issues may be masked due to the much lower speeds of conventional broadband. The first (and possibly most important) recommendation is not to use WiFi at all for fixed devices. You should connect fixed devices (such as PCs, games consoles, smart TVs, network streaming devices, DVD/blu ray players and set-top boxes) to your router using Ethernet cables. The absence of unsightly wires and the perceived ease of implementation with WiFi may have appeal. However, there can be a major performance price to be paid for convenience, and it can be easy to hide wires. Wired connections will always provide the best performance possible. While you may not relish the prospect of drilling holes or hiding cables, once installed, Ethernet cables will be trouble free and completely avoid the vagaries of wireless transmission for the long term. Since modern routers typically support Gigabit Ethernet, opt for high-quality Ethernet cable (Cat 6 or Cat 6a) to maximise performance. If you need to connect several devices located in the same location (e.g. smart TV, set-top box and games console in the living room) to a router in a different room, you can connect all the devices to a low-priced Gigabit switch. This means you will only need one Ethernet cable between the switch and the router. Here is an example of an affordable Netgear Gigabit switch sold by Amazon UK. The use of Ethernet cables with fixed devices such as smart TVs and set-top boxes is particularly advantageous since streaming video can exhibit the greatest sensitivity to performance issues. WiFi issues can cause slow load times, unnecessary stuttering and long pauses with services such as Netflix, BBC iPlayer and YouTube. Such problems usually become a thing of the past simply by connecting the device to the router using an Ethernet cable! Obviously, WiFi still has a very valuable role to play in most households since the use of Ethernet cables is not realistic for devices that are mobile in nature, such as tablets, smartphones and laptops. However, it makes sense to remove as many fixed devices as possible from a WiFi network so that the WiFi system can be dedicated to the mobile devices (and, therefore, give better wireless performance). There are two separate frequency bands in which WiFi systems can operate: 2.4 GHz and 5 GHz. WiFi routers that can operate in both bands are often termed 'dual band' routers. Older WiFi routers tend to work only in the 2.4 GHz band. Bear in mind that even though a new router may be able to operate at both frequencies, some (or all) of your devices may not! Many older devices may only operate at 2.4 GHz. bandwidth, where 5 GHz allows greater maximum data rates to be delivered. Minimisation of interference and overcoming range limitations are two critical aspects of WiFi optimisation in order to deliver the highest data rates possible, as will now be discussed. interference from other wireless devices, such as Bluetooth devices, cordless phones and microwave ovens. The use of WiFi has become prevalent in the UK, driven by strong adoption of WiFi-enabled mobile devices (e.g. smartphones, laptops and tablets) and the widespread distribution of WiFi routers by ISPs. By 2011, nearly three quarters (73.3%) of UK households had WiFi networks installed according to Strategy Analytics - ahead of Japan (68.4%) and the USA (61.0%). Today, in many streets, virtually all houses have WiFi. In theory, interference could be avoided if every WiFi access point could use a different frequency. However, the radio spectrum available is extremely limited, making this impossible. The 2.4 GHz WiFi radio spectrum is only 100 MHz wide. While there are 13 channels available, each channel is 20 MHz wide (to deliver adequate data speeds) so channels actually overlap. This means that a neighbour's WiFi router operating on channel 9, for example, could interference with your WiFi connections if your router is using channel 7, 8, 9, 10 or 11. There are only three discrete channels (1, 6 and 11) at 2.4 GHz that do not overlap with each other. Making the interference issues of 2.4 GHz WiFi yet worse, many routers can use two channels simultaneously to boost data rates, by operating in a double-channel 40 MHz mode. A router in 40 MHz bandwidth mode essentially 'eats up' two of the three non-overlapping channels. The 40 MHz mode was introduced with a safeguard that WiFi routers should be set by manufacturers to the standard 20 MHz mode 'out of the box', to minimise interference to other WiFi users. However, broadband users keen to extract the highest WiFi data rates possible can easily switch on the bandwidth-hungry 40 MHz mode. Broadband users have increasingly been investing in additional WiFi ‘extenders’ to provide more consistent coverage within their homes (and reduce the impact of interference from neighbouring properties). To avoid extenders causing interference to each other, different frequencies need to be used for each separate extender. Therefore, a home using three extenders could use all three non-overlapping channels (i.e. the entire 2.4 GHz WiFi band), causing interference to neighbours across the complete frequency band. The end result is that the 2.4 GHz WiFi band has become heavily overcrowded in many areas. Indeed, there has been a WiFi "arms race" where broadband users have seized the opportunity to improve their broadband performance (for example, using wider bandwidths and extenders), essentially at the expense of increased interference to others. Users suffering from increased interference often have to resort to the use of extenders themselves to reduce the impact of interference. Given the state of 2.4 GHz WiFi today, my recommendation is to try to manually select a channel that provides the best performance as many WiFi routers allow manual selection of the channel. You will need to read your router manual for instructions on how to do this. How do I change the wireless channel on my BT Home Hub? utilising a WiFi scanning application that identifies the WiFi channels in use in the nearby vicinity. Results can help to select the most appropriate channel to use. 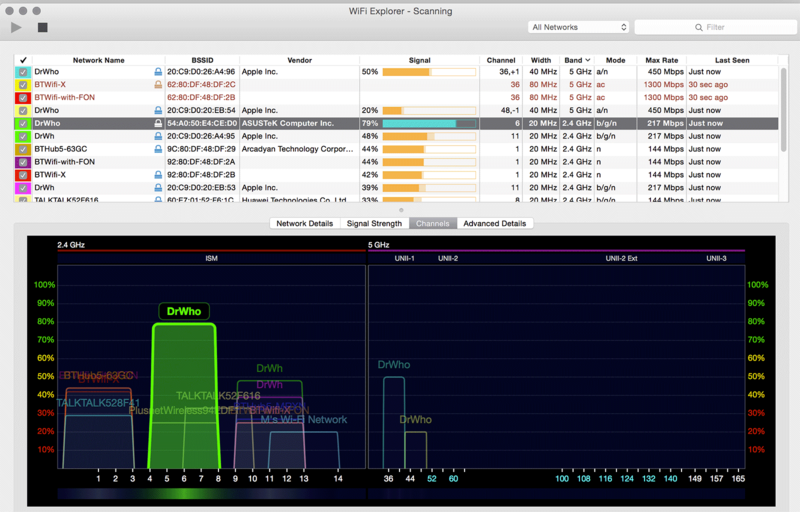 Below is a screen capture from the OS-X application called WiFi Explorer. Other applications for Windows and OS-X are available. You can see the value of a simple graphical display to help manual WiFi channel selection. Given the crowded 2.4 GHz WiFi band, you must be realistic about the improvement that you can achieve if your home is surrounded by neighbouring properties actively using 2.4 GHz WiFi. Beyond manual channel selection (which may or may not make a big difference), investment in a WiFi extender could also mitigate interference by boosting wanted signal levels. The best way, however, to address substantial 2.4 GHz interference issues is to use the less-crowded 5 GHz frequency band instead (as described next). there are more 20 MHz channels available (up to 19), which do not overlap with each other. Successful operation at 5 GHz obviously requires that your devices have the capability to operate at 5 GHz as well as your WiFi router. If a device does not have 5 GHz capability, it will simply operate at 2.4 GHz. While modern devices such as iPhones and iPads incorporate 5 GHz capability, many devices in existence operate at only 2.4 GHz. In a typical household, there may be a mix of 2.4 GHz and 5 GHz WiFi devices. In the presence of substantial 2.4 GHz interference, there could be significant differences in the performance of devices in your home. For example, 2.4 GHz-only devices could exhibit huge fluctuations in download speeds whereas 5 GHz devices will deliver much more consistent performance. While the best situation is to only have 5 GHz-capable devices, most households still have a mix of device capabilities. The easiest way to eliminate 2.4 GHz interference issues is obviously to upgrade as many of your older devices as possible to newer models that incorporate 5 GHz capability, particularly if you use them a lot. There's probably no need to replace your old PCs or laptops since low-priced USB WiFi adapters with 5 GHz capability are widely available. For example, here is a link to the Asus USB-N53 dual band wireless dongle sold by Amazon UK. Finally, as previously discussed, using Ethernet connections to older devices, such as PCs, will remove the need to upgrade them to 5 GHz capability. Many 5 GHz-enabled WiFi routers operate two WiFi networks (one 2.4 GHz network and one 5 GHz network) with exactly the same name. This means that a device connected to a dual-band router could use either 2.4 GHz or 5 GHz. A wireless router could choose to use the 2.4 GHz connection if the signal level is better than the 5 GHz connection. In the absence of interference, this could be desirable. However, interference could make the 2.4 GHz connection unstable. In order to avoid the risk of dropping back to a 2.4 GHz connection, set up your router manually to use a different network name for 5 GHz. On your device you can specifically select the 5 GHz connection and know that the 5 GHz connection will be used at all times. As well as reduced interference, 5 GHz generally provides significantly increased data rates compared with 2.4 GHz. The use of the 802.11n standard at 5 GHz offers the option of using two channels simultaneously to increase speeds. The more recent 802.11ac standard offers the highest speeds possible through the use of 80 MHz channels. Bear in mind that devices have to support 802.11ac to benefit from the greater speeds on offer. It remains to be seen, particularly with the widespread adoption of 802.11ac routers using 80 MHz channels, if the 5 GHz band becomes as overcrowded as the 2.4 GHz band. However, for now, 5 GHz operation is strongly recommended. Since there is a risk that interference at 5 GHz will increase over time, it makes sense to make use of Ethernet connections as much as your possible in your home network so that 5 GHz WiFi is left to those devices that are truly mobile. As the use of wider channels increases the possibility of interference, you may choose not to use wide channels to increase data rates, particularly if the highest rates are not required. Reduced channel widths will also mean that you will be causing less interference to your neighbours. While 5 GHz generally provides reduced interference and higher data rates compared with 2.4 GHz, its one potential weakness is that 5 GHz signals do not generally travel as far as 2.4 GHz signals. Therefore, for optimum performance, you need to ensure that your devices are located relatively close to your WiFi router. As discussed in the next section, the use of WiFi extenders could be particularly advantageous for 5 GHz WiFi. With WiFi, the best performance and speeds will be achieved when the signal-to-noise and signal-to-interference ratios are very high, which generally occur when a device is located very close to a WiFi router or WiFi access point. In general, and despite whatever is claimed by the router manufacturer, a single WiFi router will not be able to provide high signal levels to all locations in a typical house, particularly if the router is connected to the BT master socket in a room at one side of the house. Signal levels can fall dramatically as they pass through walls and ceilings. With conventional broadband, the relatively modest speeds achieved by WiFi may mask the fact that WiFi throughputs in some areas of your house drop to very levels. If you are lucky to be able to access fibre broadband speeds close to the maximum possible (80 Mbps), WiFi may be the limiting factor. One option, which may improve WiFi coverage, is to try and locate your single WiFi router in a more central location. However, moving your WiFi router could necessitate using a long modem cable between the router and the BT master socket (which we do not recommend). The best option to provide the best WiFi coverage in a house is to deploy additional WiFi access points/extenders, which are ideally located in the rooms where WiFi is used the most. This will guarantee excellent performance. Access points should be connected to the main WiFi router by Ethernet cable. Never connect WiFi access points together wirelessly, as performance can be dramatically degraded. When using multiple WiFi access points/routers, you should manually select the WiFi channels used to ensure that they use different channels that do not overlap with each other. Otherwise, they will interfere with each other, and degrade performance. Make sure they all share the same network name and security set-up (e.g. wireless password). As previously discussed, with 2.4 GHz there are only three non-overlapping channels available (1, 6 and 11). So, you should choose from one of these channels for each access point, ensuring that no channel is re-used. Since there are only three non-overlapping channels available, three is the maximum number of WiFi access points/routers that you should deploy if you are using the 2.4 GHz WiFi band to avoid interference. MIMO (which stands for 'Multiple Input, Multiple Output'), where several antennas are used at both the transmitter and receiver to increase data rates and boost received signal levels. The best performance is achieved using 4x4 MIMO (where four transmit antennas and four receive antennas are used). beamforming, where WiFi routers can control the directionality of the transmission and reception of radio signals (e.g. they can focus transmissions towards WiFi devices). When combined with 4x4 MIMO, beamforming is particularly effective. While it is early days for 4x4 MIMO and beamforming (and prices are relatively high), WiFi with such functionality will appeal to broadband users wanting to extract the very best performance from their WiFi router. Some users may prefer to invest in a single premium WiFi router with MIMO and beamforming rather than invest in WiFi extenders. Those wanting the ultimate performance may prefer to invest in both! 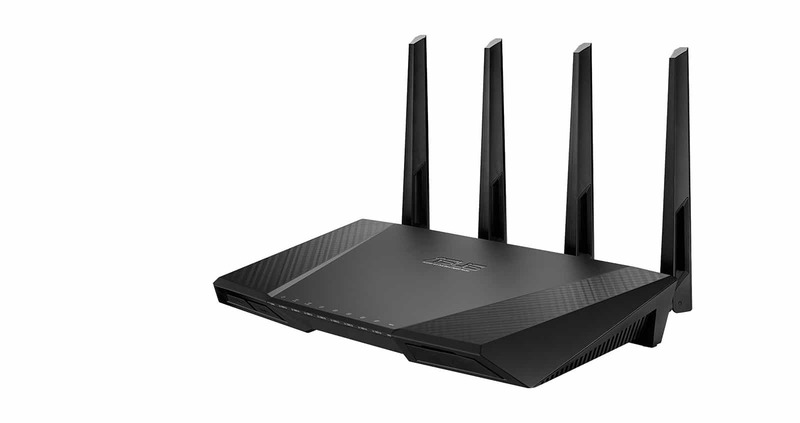 If you are keen to invest in the very best WiFi router currently available, then consider the Asus AC2400 RT-AC87U dual-band wireless gigabit router (shown below), which provides superb range and performance, and is at the leading edge of WiFi technology. If you want to purchase the Asus AC2400, please consider doing so by following the link above (to Amazon UK), as the small commission we receive helps to keep this site going while you pay the same great price. Any disappointment that you may feel after having fibre broadband installed and experiencing poor or inconsistent speeds may actually be nothing to do with your broadband connection at all. The most likely culprit is WiFi. Due to the rapid adoption of WiFi across the UK over the past ten years, WiFi signals are highly susceptible to interference from neighbouring properties using WiFi. WiFi also has limited range, which can cause performance problems. WiFi optimisation is essential to get the very best speeds that your broadband connection is capable of delivering. Use Ethernet connections wherever you possible can, for example, connecting devices such as set-top boxes and streaming devices, smart TVs, games consoles and PCs. You should not use WiFi at all for fixed devices. Manually select a 2.4 GHz WiFi channel that provides the best performance, choosing one of the following channels: 1, 6 or 11. Use a 5 GHz WiFi router, and upgrade as many of your devices as possible to 5 GHz operation. You can upgrade old PCs and notebooks with affordable 5 GHz USB WiFi adapters. Operate your 5 GHz WiFi network with a different name to your 2.4 GHz network (to prevent your devices switching to interference-ridden 2.4 GHz operation). If you are using a single WiFi router, try to centralise its location in your home to provide good coverage to areas where you use WiFi devices. Consider investing in a premium WiFi 802.11ac router incorporating 4x4 MIMO and beamforming, to extract the best performance possible, particularly if you only intend to use one WiFi device. Please visit our most popular pages and guides. If you are experiencing any other issues with your broadband connection, please visit our Increase Broadband Speed Guide. If you have an ADSL connection, you could increase speeds with SNR tweaking. A filtered faceplate could be the most cost effective way to speed up your broadband connection. Find our more on our ADSL faceplate information page. Get the most from online speed tests with our online speedtest guide.